You can link the full-size images in the gallery to other gallery page or to any address of your choice. 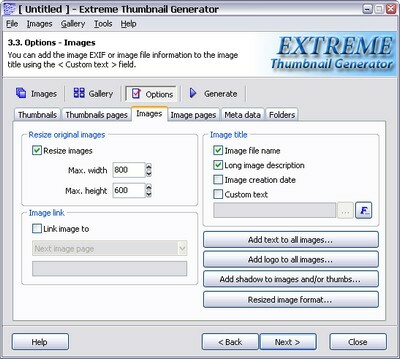 To make the images link to other pages go to the Options step, select the Images tab and check the Link image to box. When the Link image to box is checked you can choose where to link the full-size images to. If you choose Custom address the enter the address you want in the edit field below. Please note, that this options is available only if you want your thumbnails to link to the image pages, not directly to images.